rehearsal, originally uploaded by jahansell. 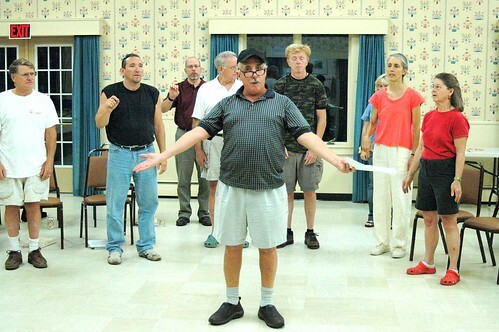 For the next few weeks, we're rehearsing twice weekly for Gilbert & Sullivan's Trial By Jury, the 11th annual production of the Light Opera Company of Salisbury. Our esteemed director, the renowned Louis Dall'Ava, here is teaching us some choreography. The performances will be on August 29 and 30 (Friday and Saturday of Labor Day weekend) at the Congregational Church - email me for details and to reserve your ticket! !